Editor’s Note: The author of this article, David Kandler, is founder and president of CompanyNewsletters.com, an Internet firm that produces newsletters for companies throughout the United States. Learn more about how his firm can help your company produce printed and electronic newsletters. 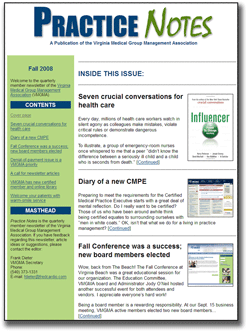 CompanyNewsletters.com created this cover of a hybrid electronic newsletter for the Virginia Medical Group Management Association. It is both a website newsletter and an email newsletter. Email newsletters have gained in popularity for good reason: they’re much less expensive to publish than a printed newsletter, and the information they contain is typically “fresher” than traditional publications because they can be produced and distributed to readers very quickly. Because an email newsletter must be created all on one screen or page, they are typically more suitable for brief newsletters, with fewer and shorter articles than traditional newsletters. If you have several longer articles, putting them all in one super-long email page becomes overwhelming for the reader and doesn’t look very inviting to read. 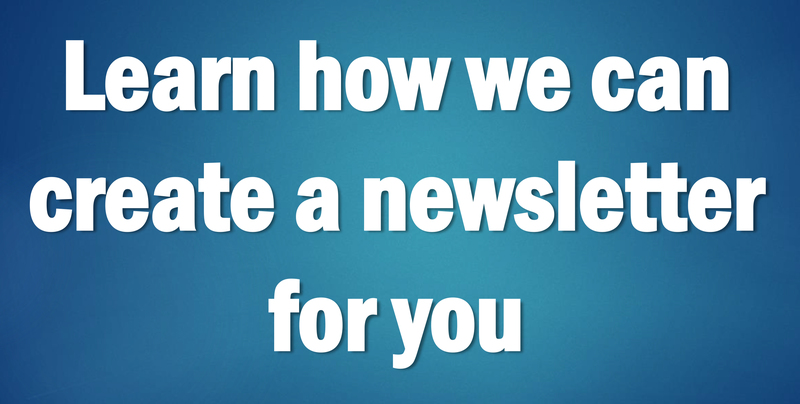 Email newsletters have very little “staying” power. Once they are sent out, recipients choose whether or not to read them and then either delete them or file them away in an email folder, and rarely do they ever come back to them. Prospective customers/readers who are not on your email list will likely never see your newsletter. A hybrid newsletter is two newsletters in one: a website newsletter (which is hosted on the client’s own website) and an email newsletter (which is sent out to the client’s email list). The good news is that all of these limitations can be overcome by doing a different type of electronic newsletter. We call it a hybrid electronic newsletter, and it’s really two newsletters in one: a website newsletter (which is hosted on the client’s own website) and an e-mail newsletter (which is sent out to the client’s email list). At CompanyNewsletters.com, where we create newsletters for companies throughout the United States, this hybrid electronic newsletter is a very popular online newsletter format with our clients, and is generally preferred over an email-only newsletter. Step 1, creating the website newsletter: We first create what’s called an HTML newsletter for the client’s website. (If the client wants an employee newsletter instead of a customer newsletter, we can create the newsletter for the client’s intranet site, so only employees can access it). This is a totally customized publication created according to the client’s wishes, and we incorporate the client’s own design preferences, including the desired color scheme and graphics/logos that the client wants included. Once the client approves the website newsletter, we put it on the client’s own website or work with the client’s webmaster to easily and quickly post the files on the client’s site. The website newsletter looks and works much like online newspaper websites that you’ve likely visited, although on a smaller scale. The website newsletter has a cover page, listing a description of all the articles that it contains, and then has links to each article, which is featured on its own page. Typically, clients will place a link to the newsletter on the home page of their website, so their website visitors can easily find the latest issue of the newsletter. Also, search engines such as Google will typically index the newsletter and will likely drive more prospective readers to the website newsletter when Internet users search for terms that are used in the newsletter. Step 2, creating the email newsletter: As soon as the website newsletter is put online, we then promote the new issue by emailing out the cover page of the newsletter to the client’s subscribers. Essentially, this is an email version of the same newsletter cover page that is featured on the client’s website. When the reader clicks on an article link in the email newsletter, the link takes the person to the relevant article in the client’s website newsletter, and the article opens in the person’s Web browser. From there readers can navigate the complete website newsletter using their browser. This process of using the e-mailed cover page to refer subscribers to articles in the website newsletter drives much desired repeat traffic to the client’s website. It also overcomes a major limitation of e-mail newsletters by allowing readers to view a larger multi-page website newsletter, which wouldn’t be suitable for an e-mail newsletter because of the large amount of content. Because of the numerous advantages of a hybrid electronic newsletter – utilizing the strengths of both website and e-mail distribution – it is a much more effective format than an e-mail only newsletter. Hybrid newsletters work better than e-mail only publications in several ways: you can publish a newsletter with lots more content and multiple pages; they have more staying power than an email that can be quickly deleted (you can even archive back issues on your website and make them available to visitors); and when search engines index the website version of your hybrid newsletter, they can attract more readers and prospective customers who may have not been on your subscriber list. That explains why hybrid newsletters are the most popular type of electronic newsletter produced by CompanyNewsletters.com and why they typically get better results and attract more readers than e-mail only publications.